As you may have already heard, we were presented with our first Active Flag during the last week of June. The Active Schools’ judge was so impressed by our entry that she recommended that we enter a European competition which provides the opportunity for schools across Europe to be nominated for the #BeActive Education Award. Unfortunately, Ms. Stirling received an email in August to say we did not make it through to the next round . However, the email highlighted that the review panel spoke very highly of our application and were particularly impressed by the work of the Active School Committee and the leadership roles embraced by the students. 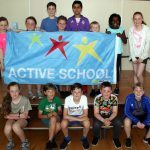 Congratulations to everybody who got up and active this year and especially to the Active School Committee for keeping us all on our toes. Below is a link to the video we sent in for the #BeActive Awards. Well done to our four Active School Committee Members who took on the leading roles!